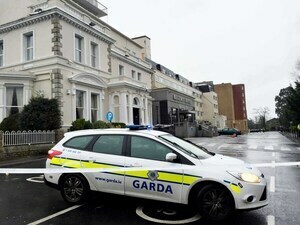 Further to the collapse of the Regency Hotel murder trial yesterday. 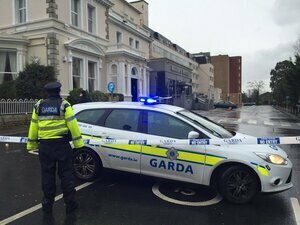 The Garda Síochána Ombudsman Commission (GSOC) has opened an investigation into the circumstances surrounding the death of the case’s lead investigator Detective Superintendent Colm Fox. Det Supt Fox was found dead by his own hand at Ballymun Garda station on February 10 last year following an adjournment in the trial after emails between four gardaí were disclosed. The State’s case was that Patrick Hutch was the man dressed as a woman photographed leaving the hotel and that he was part of a “shared intention” to commit the murder of David Byrne. Yesterday, it was because the lead Garda had died. What rubbish that such huge investigation would hinge on one Garda, when there was a team of what, 30 Gardai, and the lead Garda was reporting to more senior Gardai with progress and administative matters. This morning, the narrative is shifting to the evidence. The main evidence was the photo in the Sunday World which we’ve all seen (it’s on the front page of the Indo). Is the person in the photo Patrick Hutch? Many people say “yes”, Patrick Hutch denies it. But again, why not test that photo in open court before a jury? Last year, it was “emails” among investigating Gardai that halted the trial. What was in the emails? Do the emails show an attempt at collusion by Gardai to agree to identify the man in the photo as the suspect, Patrick Hutch. Or, it was an attempt at collusion to introduce doubt about the identity? Either way, we now deserve to see the emails. A huge criminal investigation and trial has collapsed with the prime suspect walking free and the rest of us wondering why you couldn’t prove in court beyond a reasonable doubt that the photo is the suspect. We’re paying a huge financial and social cost for the collapse and we deserve answers. Also, the GSOC investigation is an abuse of process. It’s been initiated under s91 of the 2005 GS Act. A man accused of murder with family connections to a criminal gang walks free from court because the lead investigator shot himself at his desk. E-mails between four Gardai & notes written by the lead investigator were relevant to this trial. No, this isn't a TV crime series. 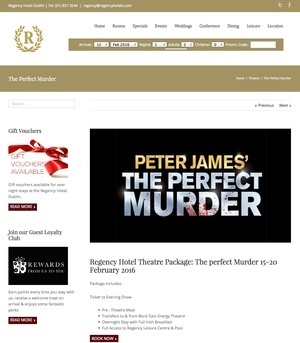 Posted in Misc and tagged Colm Fox, regency hotel at 10:31 am on February 21, 2019 by Bodger. There are some deeply worrying theories about why a Garda investigating a gang murder might feel the need to commit suicide. I hope the truth does come out, though I worry what it might mean for the integrity of the state. Any of those theories suitable for sharing here and discussed openly? Genuine question – I can’t make head nor tail of this whole saga. In the UK they have a concept “noble cause corruption” where police know a suspect is guilty but don’t think the evidence is sufficient to convict, so they fabricate. Difficulty is, the police aren’t infallible and there have been several cases, especially in the London force, of this type of corruption. The guards are an incompetent and corrupt organization, they should be disbanded and a new organization formed. Clearly the Gardai in this case were found to have withheld and fabricated evidence. The same thing is happening in the Mr Moonlight murder case. I used to enjoy watching the TV show You’ve been framed. High profile conviction equals big promotion for the investigating Gardai. The contents of the emails in question should be made public. I tuned into RTE main news last night, first seven minutes was devoted to lotto (I counted) and then there was two minutes on the colllapse of this trial. I heard Det Supt Colm Fox’s death in Feb 2018 referred to a “personal tragedy”, no mention of “suicide”. I remembered this hagiography that was written as a blog by Paul Reynolds the weekend after Gda Fox killed himself. Have you ever seen anything as flattering for someone who is now firmly in the frame for the collapse of what has been a huge investigation of a very serious crime. RTE can fupp off, it has stopped providing a reliable news service to this nation. Sorry, the blog (and it was a special weekend blog) about Supt Fox was written by Barry Cummins and not Paul Reynolds. The point stands. Good man Eoin … Condemn a deceased man you never knew and about whom you know nothing, from behind your keyboard, on no evidence whatsoever. I didn’t know Colm Fox either, but my partner did and she describes him as having been being an utterly decent man. Would you be so brave if he was still alive and could sue you for libel?? 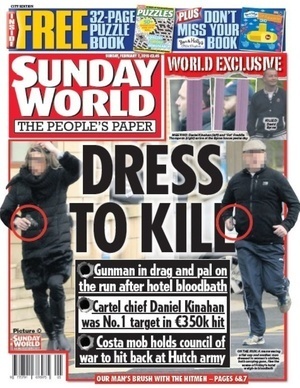 Bodger shows us the front page of the Sunday World with a pixellated image of one of the gunman. Before and especially, during, the trial an unpixellated picture was widely published, eg by RTE and indeed on the front page of the Indo today. 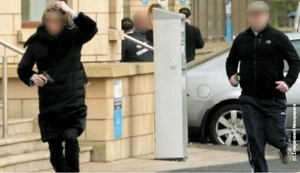 When you compare the pic of the gunman with the suspect, they certainly look alike. At least the gunman is not a black one-legged dwarf. How bloody difficult is it for Gardai to check an alibi and then present their case for a jury to decide. If you were the family of the victim, you would be inconsolable today because what looks like an opportunity for justice has been destroyed. And why? The lead detective committed suicide? There were doubts over the picture match? Is this one of those GUBU moments? Court grants Hutch right to become taxi driver (Irish Times 6th June 2001) is a GUBU moment. Had just settled with CAB……hence “tax complaint”. Unbelievable! !